AirTran Airways is launching nonstop service between Akron-Canton Airport (CAK) in Ohio and the Florida destinations Fort Lauderdale and Ft. Myers on November 4. The airline will offer flights to Fort Lauderdale-Hollywood International Airport (FLL) four times per week, on Mondays, Wednesdays, Fridays and Sundays. AirTran’s flights to Southwest Florida International Airport (RSW) in Ft. Myers will operate five times per week initially (until November 18, the flights will not operate on Tuesdays and Wednesdays) and then daily beginning on November 18. The carrier’s FLL-CAK schedule has the outbound flight, FL1238, leaving FLL at 9:00 a.m. and arriving at CAK at 11:50 a.m. The return flight, FL1239, is scheduled to depart CAK at 12:25 p.m. and arrive at FLL at 3:15 p.m.
AirTran’s CAK-RSW schedule will see flight FL1415 departing CAK at 8:00 a.m. and arriving at RSW at 10:34 a.m. The RSW-CAK flight, FL1418, is scheduled to depart RSW at 6:18 p.m. and arrive at CAK at 8:53 p.m. 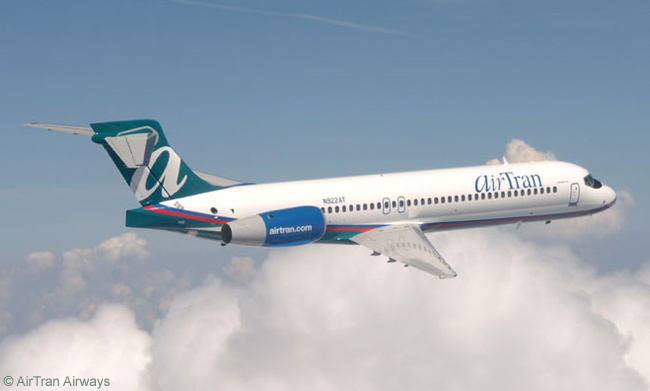 In other news, AirTran launched three-times weekly round-trip service between Charleston, West Virginia’s Yeager Airport (CRW) and Orlando International Airport (MCO) in Florida on June 25. The flights operate on Tuesdays, Thursdays and Saturdays. The outbound flight, FL1146, is scheduled to depart MCO at 2:10 p.m. and arrive at CRW at 4:05 p.m., with the return flight FL1147 leaving CRW at 4:40 p.m. and reaching MCO at 6:30 p.m.